The new edition of Fit & Well presents your students with the most trusted and proven science-based content. 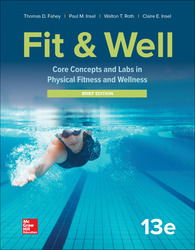 Fit & Well is written by experts who work and teach in the fields of exercise science, physical education, and health education. Fit & Well provides accurate, reliable current information on key health and fitness topics while also addressing issues related to mind-body health, diversity, research, and consumer health.